Tourists have different reasons to visit Belitung Island. What about you? One of the reasons is to reach exotic small islands near to the major one. One of them is Memperak Island. It belongs to Manggar District. The best lure of the island is its serene atmosphere. You can also feel soothing ambiance and breezy wind. 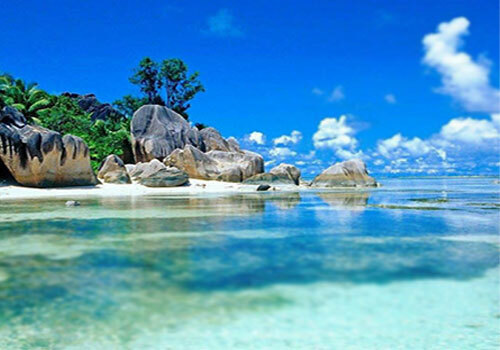 In a nutshell, the island becomes a recommended vacation retreat in Belitung. It is suitable either for a family vacation or a group tour. From afar, Memperak Island emits a remote nuance. It is true. You won’t find many people. The island is covered by coconut trees and some bushes. These create a stunning view. The sea water is calm. It is crystal clear, as well. Due to this reason, many people come here for snorkeling. The sky is blue, so you can relax while gazing on it. When it comes to the beach, you may expect soft and white sand. These are comfortable for relaxation. Travelers love to find beautiful places. What about you? Memperak Island is definitely a great destination. It offers green Tosca seawater and soothing atmosphere. Not to mention you can enjoy its nautical beauty. The most attractive parts are the coral reefs. These are the home of numerous fishes. It emits an amazing panorama, too. Simply said, the island is suitable for relaxation and beach walking. If you decide to play in the shorelines, you must wear proper footwear. Don’t go barefoot as there are many sea urchins. A vacation in Memperak Island gives you a sensation of comfort as if you are on a private island. It is because you won’t find many people there. The only inhabitant is the island keeper. He lives in one of the structures in the midst of Memperak. Since there are no facilities, you must have prepared your things. These include water and snacks. If you are lucky, the keeper may give you fresh coconut drinks. It is a quite refreshing, isn’t it? A serene mood and beautiful landscape make a perfect combination. In the coastlines, you can play in the water. In fact, it is safe to swim in it. Snorkeling is a good idea, too. The sea visibility is amazing, so you can explore the nautical beauty thoroughly. The best spot for snorkeling is the north of the island. What is next? In some occasions, sea turtles pull over to the mainland. This is a spawning phase. If you want to witness this natural phenomenon, you should come during the hot season. The thing is Memperak Island belongs to Manggar District. This is your prime destination. From Tanjung Pandan, you must spend 1 hour and 30 minutes. The trip is about 78 km. The first route is Badau – Ranggiang Street. Next, you must follow Tanjung Pandan Tengah – Manggar Street. Once you have arrived in Manggar, you must cross the sea to Memperak Island. It will be a fun journey, for sure.